Plenty of photos follow the review! Click on the pictures to enlarge. 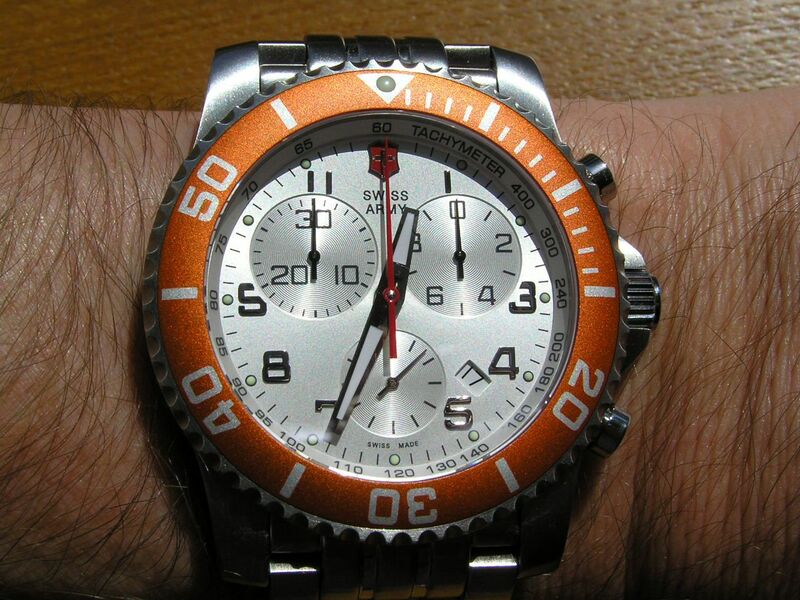 I had my eye on this now discontinued Victorinox Maverick II chronograph for quite some time, as I feel that Victorinox got just about everything right with this model. It’s a shame they are now discontinued, but that means you may be able to find a better deal on them. This model came in blue, black and red bezels as well, plus stainless steel bracelet or rubber strap options along with a titanium version. MSRP was $550 USD for the watch on the stainless steel bracelet. Street prices vary, from $175 to about $300. What attracted me to this particular model was the nifty matte orange bezel and the large chronograph subdials, which makes it easier for me to see and read the dials without any readers on. It’s a functional, clean and attractive design. 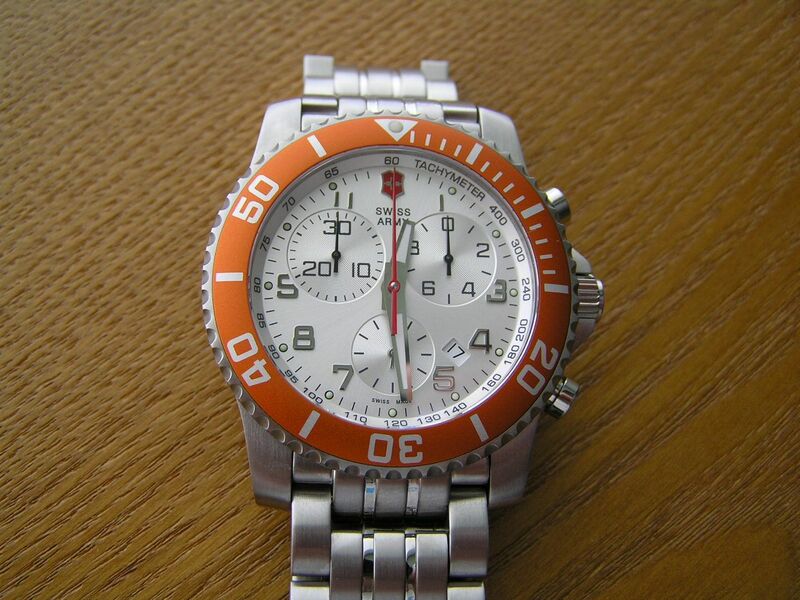 The all brushed stainless steel case measures 43mm without the signed crown, 11mm thick with 22mm lugs. A large crown guard flares out from the case to protect the crown. The finish on the case is totally acceptable but is not really any better or worse than similar brushed efforts from lower end brands such as Invicta. The case back is brushed stainless steel and screws down. The watch is factory rated for 100 meters water resistance. 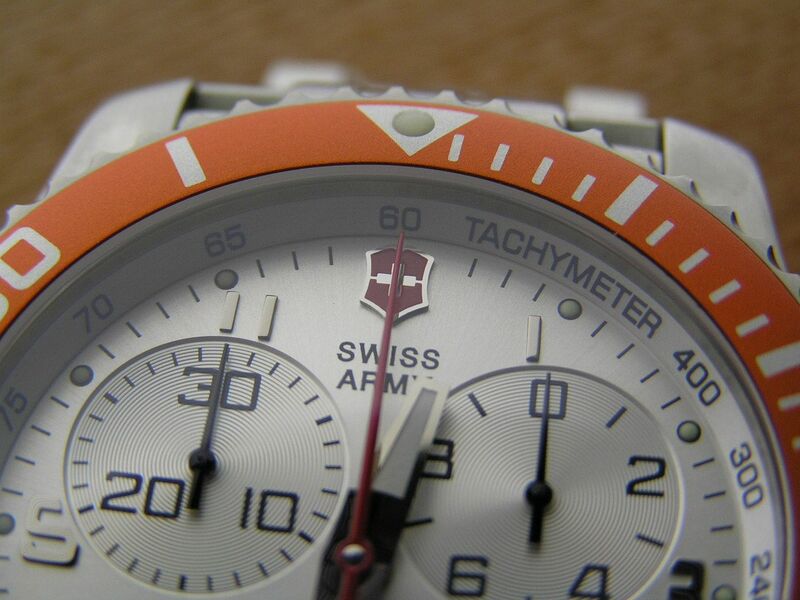 The dial is a clear silver color with an internal tachymeter chapter ring and a red Swiss Army logo at the 12 with ‘Swiss Army’ wording under the logo. The chrono second hand is red, the hour and minute hands are silver with infilled lume and have a great squared off shape about them. The hands can be a bit difficult to see in all lighting conditions; if they were black like the two top subdial hands, visibility would be improved, but this is not considered to be a ‘must have’ request. I also appreciate the lack of extraneous wording on the dial, no ‘quartz’ ‘water resistant to 100M’ or anything like that is present to clutter up the dial. 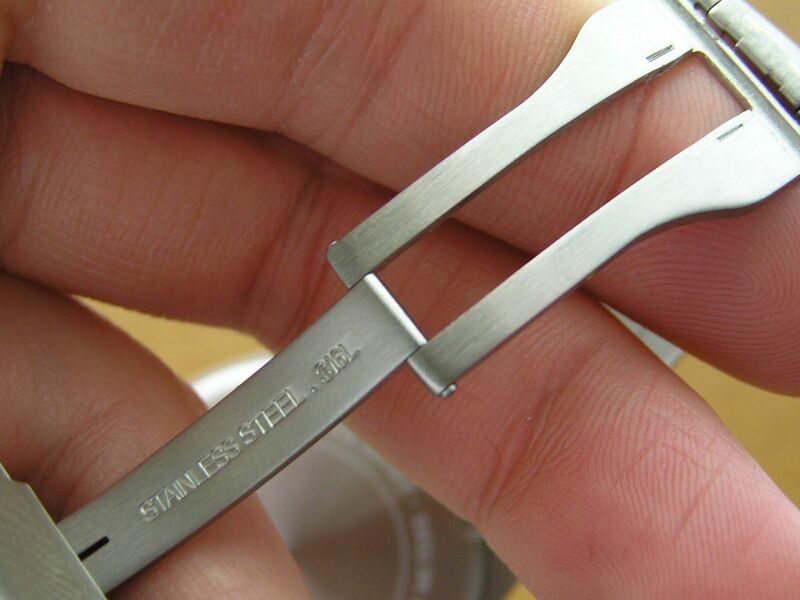 The only other wording than that already mentioned is a small ‘Swiss Made’ beneath the subdial at 6. 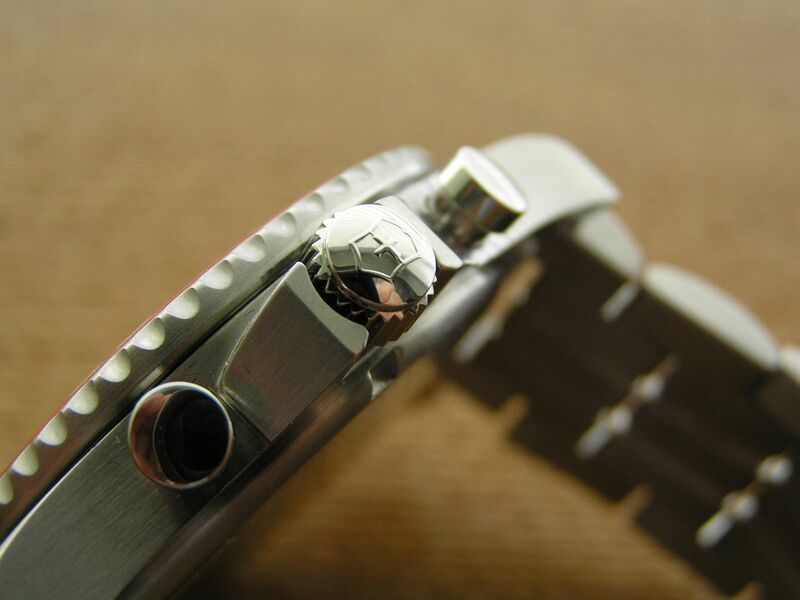 The subdial at 6 is the main second hand for the watch, with the hand in silver. This subdial has simple black hash marks every five seconds for a cleaner look, which doesn’t really distract from its functionality. The second hand hits these markers accurately. 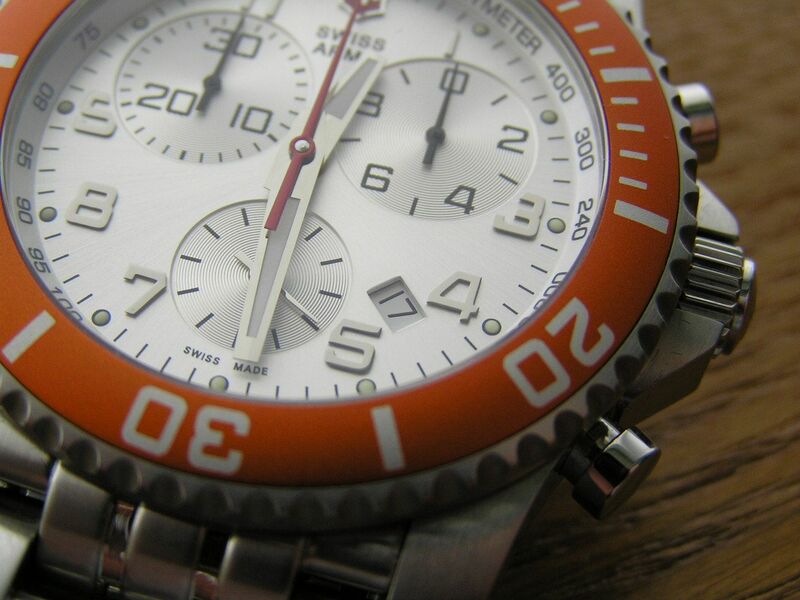 The chronograph measures up to 30 minutes in tenth of second increments. There is no lap timing capability. The subdial at 10 is the 30-minute totalizer for the chrono, the subdial at 2 is the tenths of seconds totalizer. Both hands in these subdials are black. The tenths totalizer only indicates tenths when the chrono is stopped; while the chrono is running, it remains stationary to conserve battery power. The chrono pushers have a slight retro design to them. The dial also includes silver applied Arabics and small lume dots around the perimeter. 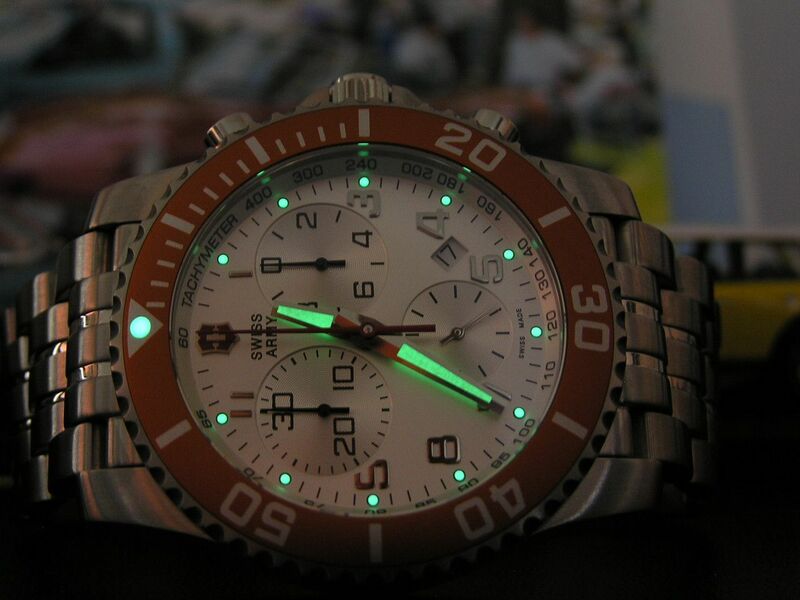 The lume is typical Victorinox quality, ie: very good. One thing I appreciate with this watch is that the applied silver Arabics are mostly intact, only the ‘3’ and the ’9’ are slightly hacked off, which still makes them useable and their appearance acceptable. I dislike watches that have severely hacked off Arabics, where only 20% or so of the number is in place, it just looks stupid. 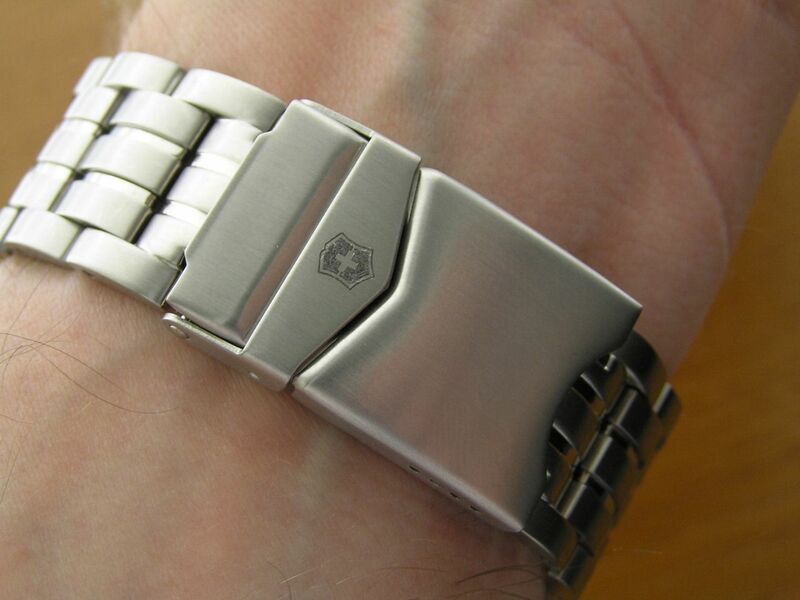 Hats off to Victorinox for preserving design integrity here. The bezel is a pleasing shade of matte orange with a lume pip at 12. The bezel is a 120-click unidirectional design with a fairly smooth action and a bit of play. The bezel could be a bit smoother in its action, but I’m picking nits here. The crystal is flat sapphire with three layer anti-reflective coating and no cyclops. The quickset date resides at the 4:30 position. The quartz movement is a Swiss ETA Caliber 251.272 (gold plate, 22-jewels) that is currently running +2 seconds a week. Not as accurate as my Swiss Army quartz Divemaster, but acceptable. This is the same movement as in my Sector 600 chrono. The identifying feature of this ETA movement is that to change the date, the hour hand is rotated through a 24-hour cycle with the crown at the ‘1’ position, while the watch continues to run. Not super ‘quick’ as quicksets go, but the advantage of this design is that during changes to or from daylight savings time, you can easily move the hour hand back or forth one hour (or change to another time zone when travelling) without stopping the watch, so if it’s been set to atomic time recently, accurate time keeping with continue with no need to reset. I can take or leave this design, I’m neutral on it. The 22mm bracelet is not overly hefty and seems a bit rattle prone, but the quality is quite nice with solid links and solid end links. The bracelet tapers to about 20mm at the clasp. Each link is seven individual pieces, with five brushed and two thin polished links. A very classy look. Links are held in by standard split pins. 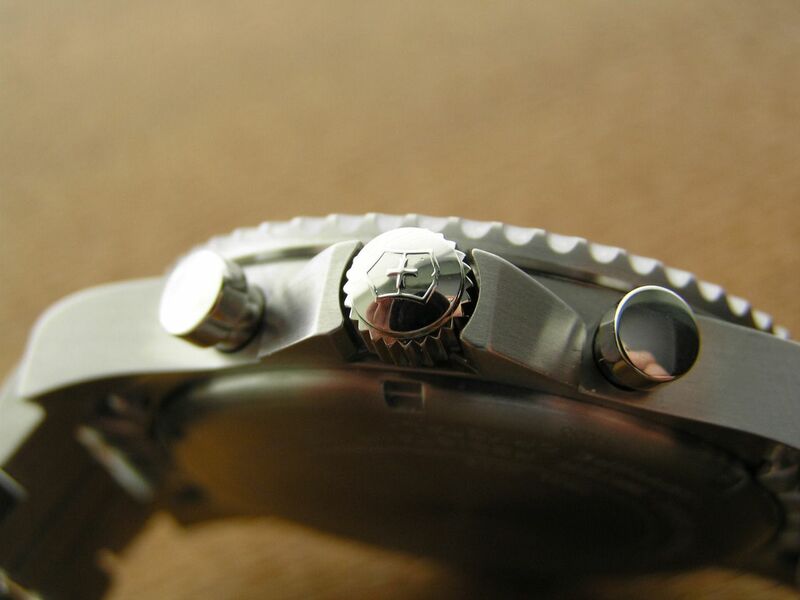 The clasp is signed with the Swiss Army logo and has a double locking safety clasp and a proper machined deployant. 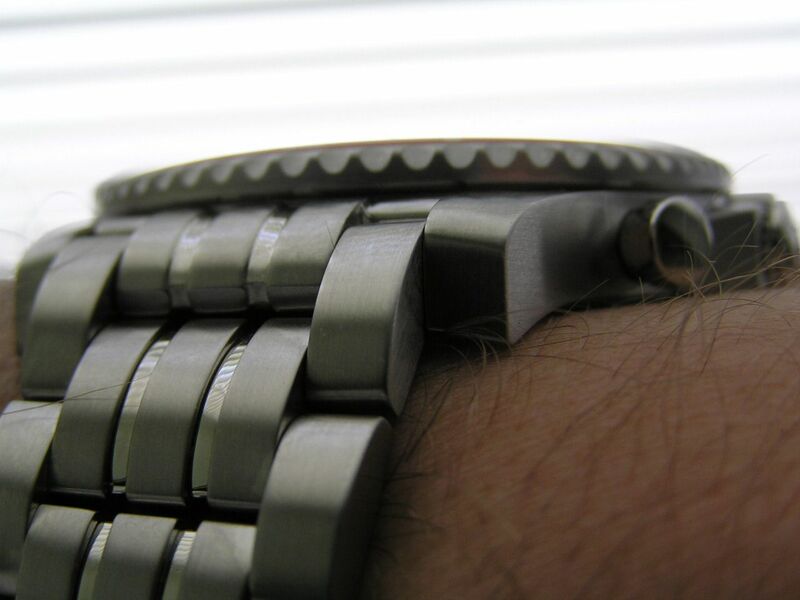 A stamped steel diver’s extension is also included. The clasp has four micro pin adjustments, making a perfect fit more likely. I achieved a good fit for my thinner wrist. Comfort seems good with this watch, as it lays fairly flat on the wrist and is not top heavy like some larger BCD (big, chunky diver) divers can be, therefore it stays in position while looking great. The presentation box was an uninspiring black cardboard affair more suited to a $40 fashion watch than a Swiss timepiece with an MSRP of $550. 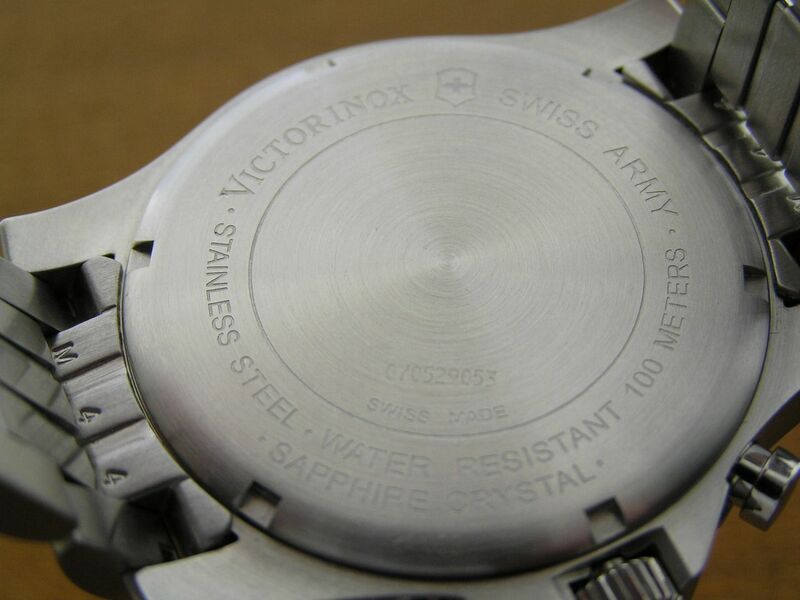 Victorinox could certainly do better in this regard. Some might argue that Victorinox puts its money into the watch and not the box, which could be true, but I feel that any watch with an MSRP over $500 should come with a decent presentation box. 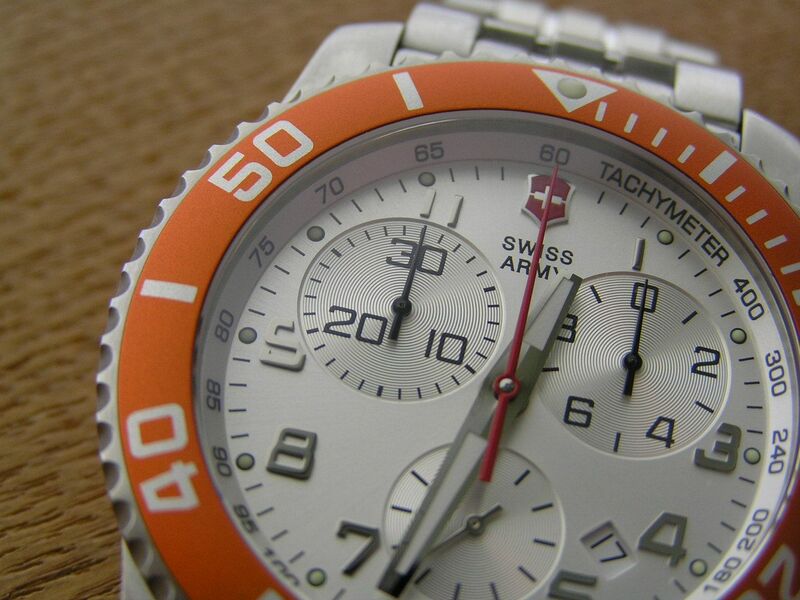 This watch represents a superb value in a Swiss quartz chrono when purchased under $250. Great overall Victorinox quality that is a notch above most Asian brands and a look and feel of quality and durability. I have owned this watch for over six months now and time keeping accuracy is about the same as stated above, maybe a tad better. 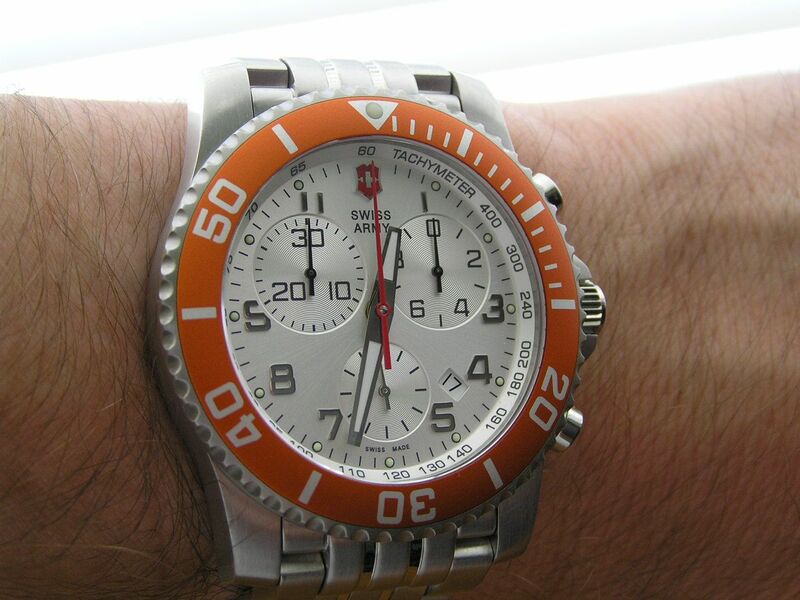 The watch still pleases me and I love the orange bezel and overall look of the dial. 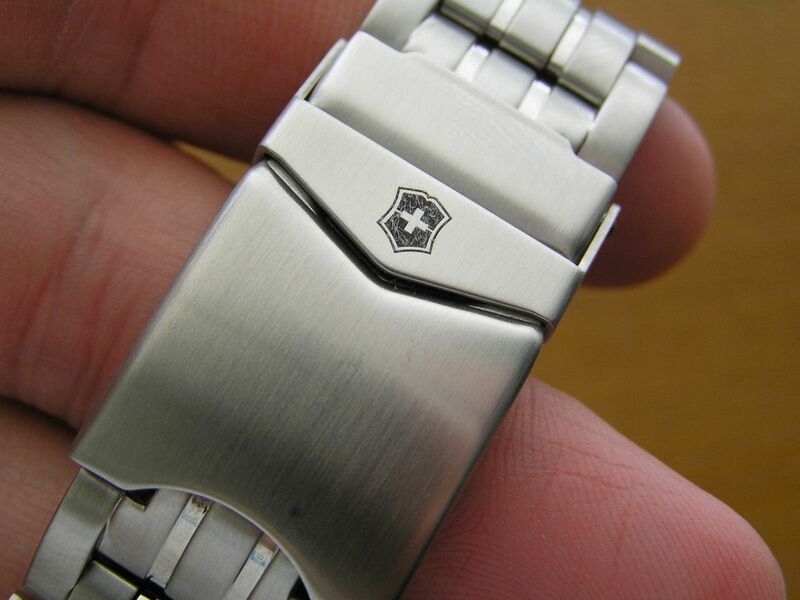 The black Victorinox logo on the clasp looks kind of cheap, it would be better if they had engraved their logo instead. I still recommend this watch for anyone looking for a reliable, fashionable well-made quartz chronograph. what part of case is aluminium made of? 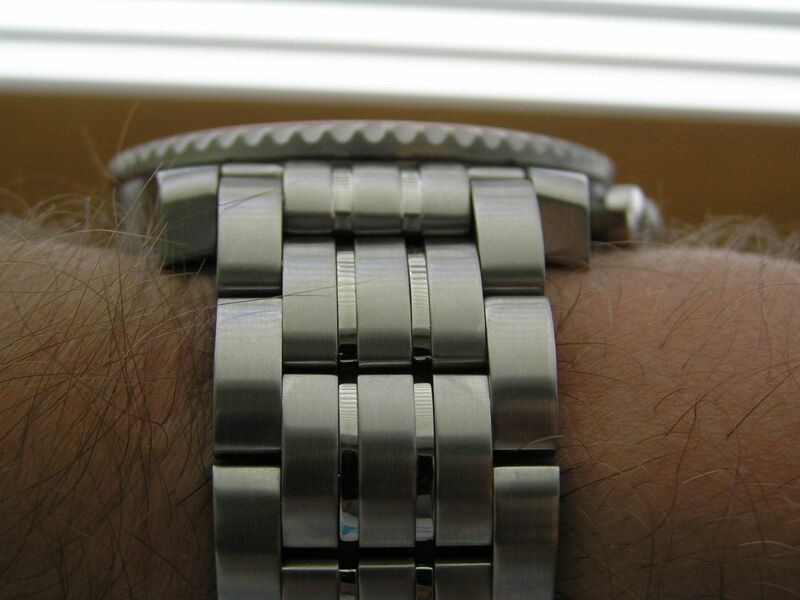 The only part of the watch that would be aluminum would be the bezel insert. The movements are not the same, very similar, but not the same. Both are good movements. 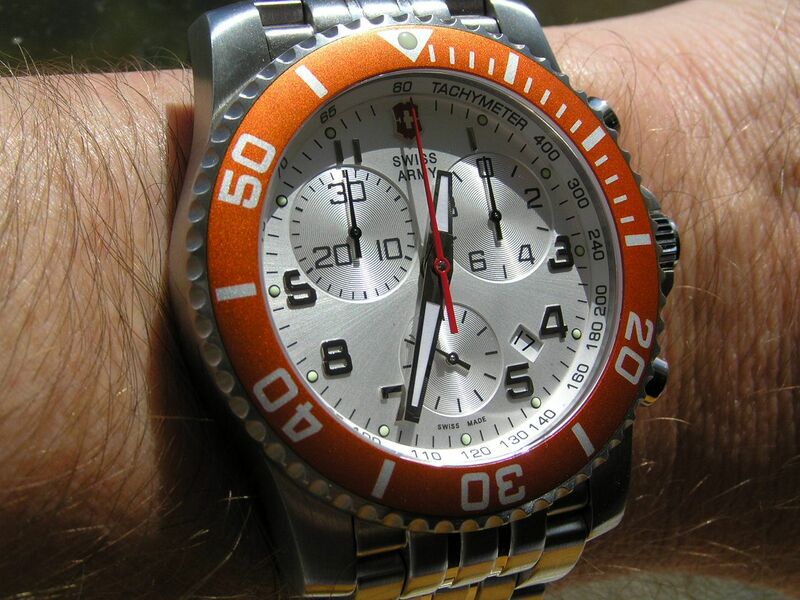 Would you know the caliber of my VSA Maverick II chrono #24145? The booklet the watch came with did tell nothing as well as the saleslady at the AD didn't knkw a thing or 2 about calibers? That was a prompt reply. Now i know. One more thing, which came first, 24145 or 241088 as i bought mine at 50% discount just this Oct2017 at the AD and that numbering is tricky (6 digits for yours vs 5 on mine)? I'm glad i chanced upon the AD during a mall-wide sale and used half of my budget already alloted for a Tissot PRC 200 Powermatic 80. It's really a good buy and that Tissot i originally dreamt of can wait a bit longer. Keep up the good posts. Don't really have an answer regarding the series number five vs. six, those things change from time to time and it really shouldn't make a difference; you bought your watch from an AD and at half off, so you're good to go with a great watch, so enjoy it. BTW, the Tissot Powermatic 80 is a decent movement, so if and when you get that one, you should like it.